What Is Thyme and How Is It Used? Thyme is one of the best-known and most widely-used culinary herbs. It is quite easy to grow and is commonly found as a decorative and functional plant in many home gardens. Instead of being the dominating taste, this aromatic herb helps balance the flavors of a dish; it has a minty warmth that works well with ingredients like onion, garlic, parsley, and ginger. You will find thyme a welcome flavor in chowders, stuffings, poultry and meat dishes, and roasted vegetables; it even works well in desserts and cocktails. A member of the mint family and related to oregano, thyme is a perennial evergreen shrub, whose sometimes woody stems are covered with small, gray-green to green leaves. Its small, two-lipped flowers range in color from pale pink to purple and bear quadruplet nutlet fruits. The entire plant is aromatic. There are hundreds of varieties of thyme, and the many types are so close in appearance it is often difficult to differentiate them. When it comes to cooking, the most common varieties are garden thyme and lemon thyme. Garden thyme (also called common thyme) has a gentle, floral tone that pairs well with almost anything, while lemon thyme has a slightly more pronounced lemony fragrance that is particularly good with seafood. These two varieties look very similar but can be distinguished by their aroma. All varieties of thyme are highly attractive to bees. (Honey from bees that feed on thyme flower nectar is a gourmet delight.) Yet, interestingly enough, insects are repelled by thyme. Make a cup of thyme tea, put it in a plant mister, and spray around doorways and windows in summer to repel insects. Common thyme is one of the most versatile herbs you will have in your spice drawer. It is not very aromatic but does have a warm, somewhat sweet taste reminiscent of mint. Slightly spicy undertones round out the herb's flavor profile. Some may consider thyme's flavor to have a bit of bitterness, but not enough to overwhelm. Lemon thyme has a citrusy flavor that can mask this bitter taste. Like fresh lemon, it adds a brightness to a dish and works very well in salads and dressings and well as with fish. Thyme is an herb that is readily available both fresh and dried. Fresh, sold as bunches with the leaves still on the thin, stick-like stems, is found in the produce section; dried, which consists of the dried leaves that have been crushed, is sold in jars in the spice aisle. 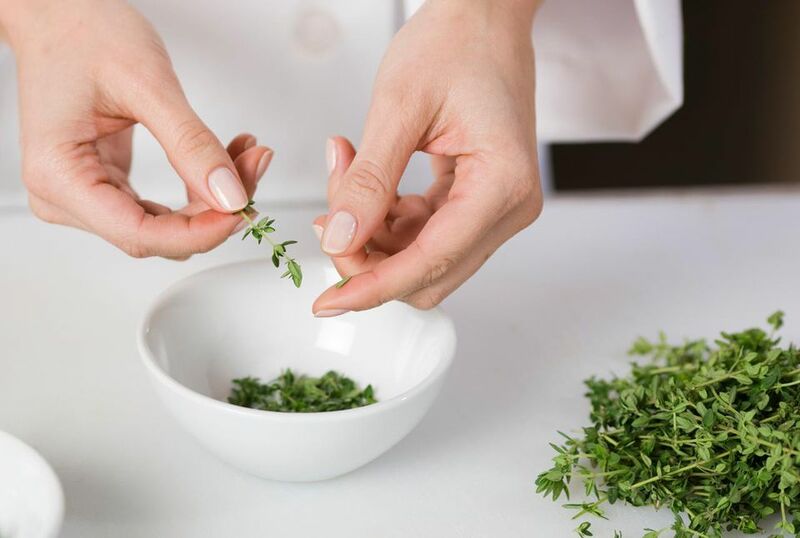 As with most dried herbs, the flavor is much more concentrated and therefore you need to use less than what is called for when using fresh; the general rule is 1 tablespoon of fresh herbs is equivalent to 1 teaspoon of dried. When using fresh, you only add the leaves since the stem is quite stiff and fibrous. To easily remove the leaves, pinch the top and run your fingers down the stem pulling off the leaves as you go. You also need to add fresh and dried at different times during cooking—dried should be incorporated early on, so the heat and moisture of the dish can help slowly release the herb's flavor, while fresh needs to be added at the end so as not to mar its taste. Because this herb is so versatile, it can be used in a wide range of recipes—from savory to sweet. It is a ubiquitous seasoning for Thanksgiving stuffing and is an essential ingredient in bouquet garni, a French herb mixture, as well as a prime ingredient in the expensive Benedictine liqueur. Fresh thyme should be stored in the refrigerator; either place in a plastic bag in the vegetable drawer or stand sprigs in a glass of water (like you would a flower arrangement) and put on the refrigerator shelf. Dried thyme should be kept in a cool, dark spot for no more than 6 months. Thyme has been used for centuries in more than just the culinary realm. The ancient Egyptians used the herb for the embalming process and it was employed as incense by the Greeks. But it also has many health benefits as it contains high concentrations of essential vitamins and nutrients, such as vitamins A and C, fiber, iron, copper, and manganese. It is known to treat acne, lower blood pressure, relieve a cough, and boost the immune system, as well as help heal wounds, improve digestion, and maintain kidney function. Thyme also can disinfect as it may hold fungicidal properties. Studies have shown that by releasing the oils in the herb you can repel mosquitos, as well as elevate your mood. To get the most out of this herb for health benefits, infuse the dried thyme leaves in boiling water and drink a few glasses a day. You can also use thyme essential oil in a hot bath or an oil burner.